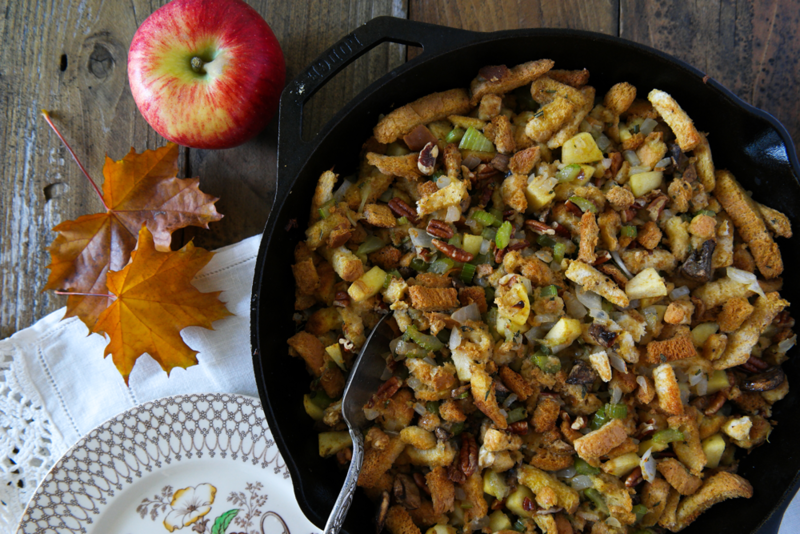 Your kitchen will smell like holiday heaven thanks to our recipe for the best holiday stuffing with apples! Dress your turkey with our simple homemade stuffing for guaranteed holiday meal success. This recipe is adapted from a longstanding family stuffing recipe going back generations – tried and tested! We like to use SugarBee® apples for this recipe but other seasonal apple varieties also work beautifully. Pre-heat the oven to 350°F / 180°C. Spread the coarse bread crumbs evenly on a rimmed baking sheet and bake until dry but not toasted, about 5-10 minutes. Keep an eye on the bread as exact timing will ultimately depend on the kind of bread used and the size of the crumbs. When bread crumbs are done, remove from the oven and pour them into a large bowl. Heat olive oil in a medium non-stick pan over medium-high heat. Add the celery and the onions and cook for 5 minutes. Add the apple and cook until all ingredients have softened and the onion is translucent. Add the celery and onions to the bread crumbs and mix carefully. Return the pan to medium-heat (no need to wash it) and add mushrooms. Sprinkle a little salt on the mushrooms, this will help release their water. Cook until soft and reduced in size. Add mushrooms to the stuffing mixture and mix carefully. Add pecans, rosemary, thyme and sage to the stuffing and mix carefully. Pour broth evenly over the stuffing and mix so that it is evenly absorbed by the bread. You can now stuff your holiday turkey! Place all extra stuffing in a greased baking dish, cover with foil and place in the oven under the turkey until warmed through, about 15-20 minutes. If the stuffing is a little dry, add extra broth to moisten. We like to make our own coarse bread crumbs by tearing up different types of bread (crusty baguette, dense whole wheat, etc.) but you can use any kind of bread you like. Feel free to cube the bread if you prefer. To make this recipe suitable for vegetarians and vegans, use vegetable broth and bake stuffing in a baking dish in the oven (see step 13 above).